Recorded/performed at: City Recital Hall, Angel Place, Sydney, on Dec 06. Elena Kats-Chernin Elena Kats-Chernin 3 mins, 11 sec. Recorded/performed at: City Recital Hall, Angel Place, Sydney, on Dec 06. Food and music are true companions. It's not often that they get together in the music industry! This CD represents a unique collaboration between two wonderful Australian artists: popular composer and pianist Elena Kats-Chernin, and her friend, celebrated chef, Kylie Kwong. Recorded by Tall Poppies Records as a 50th birthday gift for Elena, this music is for listening to over dinner. 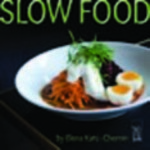 The gentle style of the music suggested the title "Slow Food". Kylie Kwong has contributed a wonderful dish for the cover, and the recipe is in the CD booklet. Kylie's talented brother Paul Kwong designed the art for the CD. The title refers to two current trends in food - slow food either as long-cooked food (not fast food) or as food that has not had to travel too far to the table. This CD celebrates the latter meaning. The music is also slow, in that it hasn't had to travel too far to the listener! Recorded in Sydney's beautiful Angel Place Recital Hall, this CD presents Elena Kats-Chernin as performer of her own music, initiating a series of CDs of Australians playing their own music from Tall Poppies. Elena is a powerful and sensitive pianist, and these are some of her favourite piano pieces. This CD includes Elena playing Eliza Aria, the piece of hers which shot to fame as result of its use in a series of animated TV ads in the UK for Lloyds Bank. It is available for download as a ringtone and has been listed as No 1 on the UK iTunes Classical Chart. Tall Poppies recommends that you cook dinner, light the candles, play this music and enjoy the magic! Please Note: The recording of "Reflections" on this CD does not match the available score. Score: Reflections : for solo piano / Elena Kats-Chernin. Score & Part: Eliza aria : from Wild swans suite, for Bb trumpet and piano / Elena Kats-Chernin. Score: Butterflying : for children's choir and piano / music by Elena Kats-Chernin ; words by Chris Latham. Score: Naive waltz : for string quartet / Elena Kats-Chernin.